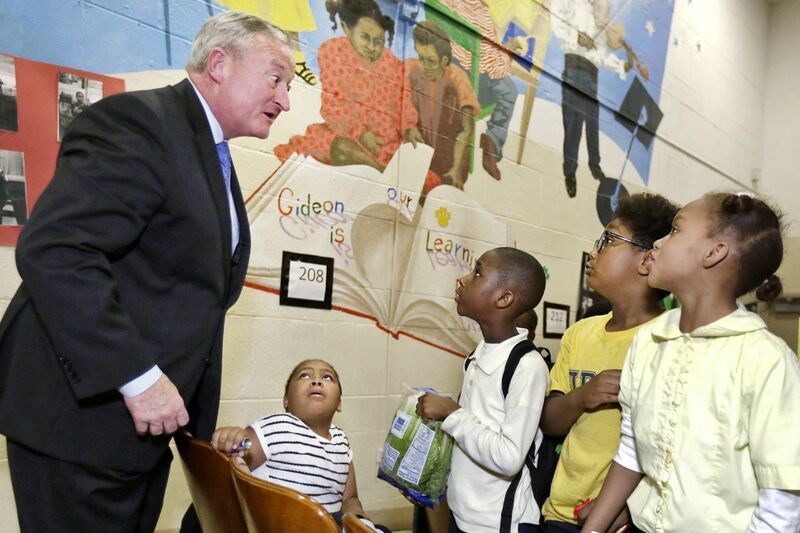 Mayor Kenney jokes with students at Gideon Elementary, a Philadelphia community school. Mayor Kenney pitched community schools as a linchpin of his administration, a key reason Philadelphia needed the controversial soda tax. It would take a number of public schools and transform them with supports, resources, and a city-paid staffer to coordinate them, enabling school staff to focus more on improving academics. Two years into the initiative — which has a $3.25 million budget this fiscal year — the city's community schools are not yet transformed, and overall, the effort's results have been mixed, according to a study released Thursday by Research for Action, the nonpartisan Philadelphia nonprofit. While there have been some school-level victories, the community-schools model has been hampered by limited coordination between the school system and the Kenney administration and by a lack of standardized systems that could allow leaders to track individual students' progress, the report says. The program "could be improved with stronger leadership from the Mayor's Office of Education and more extensive cross-sector collaboration," it found. Situated around the city, the 12 community schools — Cramp, F.S. Edmonds, Gideon, Gompers, Locke, Logan, and Southwark elementary schools; Tilden Middle School; and Dobbins; Kensington Health Sciences; and South Philadelphia and George Washington high schools — each have a different focus, but the goal is the same: to remove barriers to learning by embedding select resources inside the schools. South Philadelphia High, for instance, has a clothes closet and a food pantry and focuses much of its work on jobs and career training; Tilden's amenities include a mindfulness room and an emphasis on mental-health services. One bright spot has been the quality of the community-school coordinators, those staffers charged with assessing schools' needs and finding resources to match them. At one school, a staff member described that coordinator to researchers as "a fairy godmother; if you say, 'We really need to have this,' [the coordinator] finds a way." But those workers are often stretched too thin, the report found. And while student participation in the community schools' programs and services was high — 85 percent of those surveyed said they attended at least one community-school event in 2017-18 — connections with families and the larger community have been tough, stymied by "a history of fear, mistrust, and lack of involvement with the school among community members," the report said. There have been other hurdles, too; some schools have offered evening and weekend programs, but in other cases, security and funding issues have prevented the kind of wider programming envisioned. There seemed to be a disconnect, too, between what students say they need and the kind of programming offered. More than 80 percent of teachers and staff said that community-school services matched students' needs, fewer than 20 percent of students made that claim. About 7,000 students attend the schools; 890 students and staff were surveyed. Otis Hackney, Kenney's chief education officer, said that the report will serve community schools well and that its recommendations are already being implemented. "We value this opportunity to take a clear look at where we can improve and are excited to work with the school district and many other partners to strengthen the initiative going forward," Hackney said in a statement. Lee Whack, a district spokesperson, said the school system was pleased with the work in progress. "The behavioral health supports and the community partnerships have been very beneficial, and we believe they will continue to grow," Whack said in a statement. "We greatly appreciate the commitment from Mayor Kenney and City Council in this effort to support Philadelphia children and communities."